An international research team, including University of Minnesota researcher Craig Packer, has found the first clear example of how climate extremes, such as the increased frequency of droughts and floods expected with global warming, can create conditions in which diseases that are tolerated individually may converge and cause mass die-offs of livestock or wildlife. The study, published June 25 by PloS (Public Library of Science) One, an online peer-reviewed research journal, suggests that extreme climatic conditions are capable of altering normal host-pathogen relationships and causing a "perfect storm" of multiple infectious outbreaks that could trigger epidemics with catastrophic mortality. 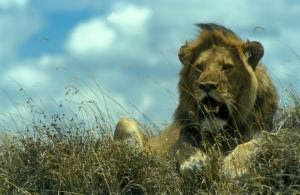 Led by scientists at the University of California, Davis, the University of Illinois and the University of Minnesota, the research team examined outbreaks of canine distemper virus (CDV) in 1994 and 2001 that resulted in unusually high mortality of lions in Tanzania's Serengeti National Park and Ngorongoro Crater. CDV periodically strikes these ecosystems, and most epidemics have caused little or no harm to the lions. The canine distemper virus suppressed the lions' immunity, which allowed the elevated levels of blood parasites to reach fatally high levels, leading to mass die-offs of lions. In 1994 the number of lions in the Serengeti study area dropped by over 35 percent after the double infection. Similar losses occurred in the Crater die-off in 2001. The lion populations recovered within 3-4 years after each event, but most climate change models predict increasing frequency of droughts in East Africa. "The study illustrates how ecological factors can produce unprecedented mortality events and suggests that co-infections may lie at the heart of many of the most serious die-offs in nature," said Packer, Distinguished McKnight University Professor of Ecology, Evolution and Behavior at the University of Minnesota. The study was funded by the National Science Foundation and the Morris Animal Foundation.